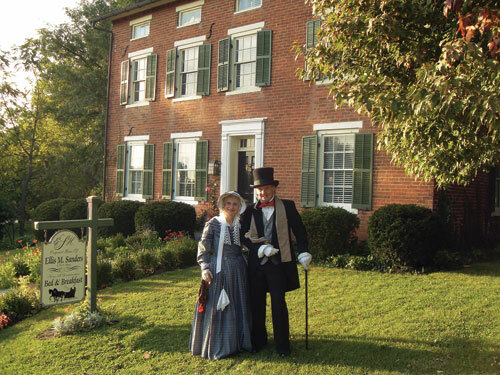 Operating a bed and breakfast in Nauvoo Ill., provides David and Diane Owen a chance to immerse themselves in Church history, including acting as historical figures. One morning, Diane Creer Owen (’73) and David S. Owen (BA ’73) were fixing breakfast in their Nauvoo, Ill., bed and breakfast when water began gushing out of the toilet. David raced to the basement, examined the plumbing, and determined that a squirrel had climbed into the pipes. Despite the chaos that ensued, the Owens managed to unplug the animal, make repairs, and serve a delightful breakfast right on time without their guests suspecting a thing. 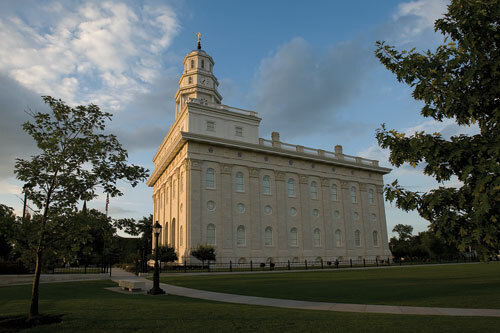 It was actually in the Nauvoo temple’s celestial room that the couple felt inspired to move to Nauvoo. After Diane wrote a book about her great-grandfather who had cut stone for the original temple, she and her husband were invited to the dedication of the new temple in June 2002. Following President Gordon B. Hinckley’s dedicatory prayer, the couple went to the celestial room and found themselves alone. The Owens knew they needed to move to Nauvoo, but it wasn’t until they saw the Sanders house covered in snow with candle lights shining in every window that they knew they should open a bed and breakfast in this historic home. When the house was under construction in 1844, Ellis Sanders offered the basement as a refuge to his friend Joseph Smith Jr. The Sanders family moved into the completed house in July 1845; they lived there for only 10 months before moving west with the Saints. Today the red brick home is full of eclectic charm. David’s travel as a London-based flight attendant in the ’70s provided plenty of antiques and accents that now adorn the rooms of the house. Guests visit the bed and breakfast year round, but the Nauvoo pageant in July and August prompts the most requests. The Owens put on tea and garden parties, organize carriage rides, and host wedding luncheons and receptions. Their favorite thing to do, however, is to play pretend. David and Diane Owen occasionally transform themselves into John and Leonora Taylor, the third president of the Church and his wife, an organizer of the first Relief Society. Complete with head-to-toe period clothing and well-rehearsed accents, the two talk about their characters’ lives as early Saints. David even performs hymns as John, who was known for his beautiful singing voice. “People in town know us as John and Leonora,” says Diane. The Owens feel they’ve been called on a mission to do this work in Nauvoo. They say their experience has greatly increased their appreciation of early Saints, both well-known and those largely nameless. “We’ve learned so much history here from studying, from visiting places, from people who have stayed with us,” David says.